Transmitter 05259 was put on a juvenile female peregrine at Pittsburgh's Gulf Tower nest on July 14, 2003. Updates on her movements will be posted below. November 15, 2003: 41.4N, 81.8W (Cleveland OH). No appreciable change in 05259's position over the past couple of weeks, as she remains near central Cleveland. October 27, 2003: 41.4N, 81.8W (Cleveland OH). 05259 continues to drift very slowly west through Cleveland, with the most recent signal placing her a few kilometres east of the airport. October 23, 2003: 41.4N, 81.7W (Cleveland OH). No appreciable change in 05259's position over the past two weeks. October 9, 2003: 41.4N, 81.7W (Cleveland OH). 05259 has remained in the Cleveland area now for more than a week, gradually moving closer and closer to downtown. September 30, 2003: 41.6N, 81.5W (Cleveland OH). Sure enough, just a day after commenting that she isn't moving, 05259 has made a flight roughly 180 kilometres to the northwest, reporting to us today from the northeast side of Cleveland, Ohio. Not quite a typical southward migration, nor anything like the eastward movements observed by the Pittsburgh peregrines last year, so 05259 still has us guessing - it will be interesting to see where she heads next. September 29, 2003: 40.4N, 79.9W (Pittsburgh PA). 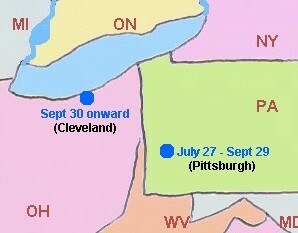 After more than two months of observation, 05259 has yet to make any appreciable movements away from Pittsburgh. September 18, 2003: 40.4N, 79.9W (Pittsburgh PA). A week ago, 05259 made a short foray to the east, but as of yesterday she's back in downtown Pittsburgh, right near the confluence of the Allegheny and Monongohela Rivers. September 5, 2003: 40.4N, 80.0W (Pittsburgh PA). Still no appreciable change in 05259's pattern of movements. August 27, 2003: 40.4N, 80.0W (Pittsburgh PA). So far at least, 05259 is not proving to be very adventurous, with all of her reports still coming from the downtown Pittsburgh area. August 10, 2003: 40.4N, 80.0W (Pittsburgh PA). 05259 has still shown relatively little movement away from downtown Pittsburgh. July 27, 2003: 40.4N, 80.0W (Pittsburgh PA). Not surprisingly, 05259 remains in downtown Pittsburgh. At this point she is likely still dependent on her parents for food, and probably not ranging far from the Gulf Tower yet.